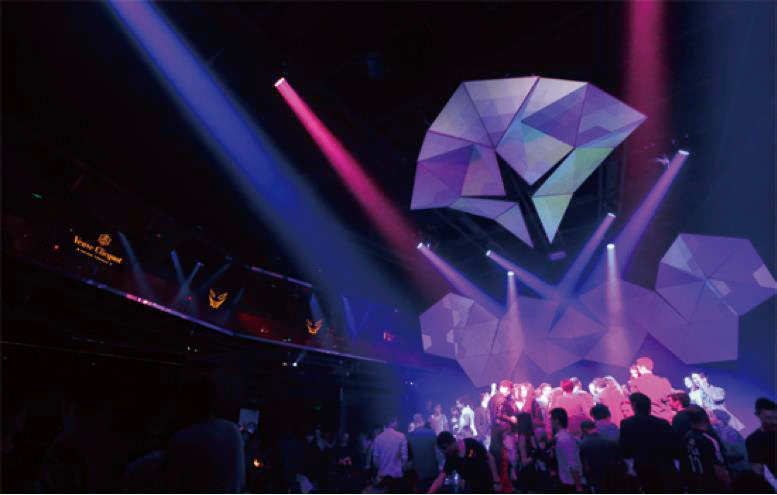 Shanghai Mook Club, one of the most popular nightlife hotspots in the financial capital of China, recently installed a full Martin lighting system, creating an exciting experience for Shanghai’s partying public. The club’s vibrant and urban-style interior design is complete with a vast number of Martin lighting fixtures. Mook combines local music with international flavors for a premium clubbing experience, hosting world-renowned DJ’s and bands on a monthly basis. Therefore, it needed a lighting system as versatile as Martin to accommodate its broad music selection. To bring an extraordinary party experience to the nightclub, the system was designed to be highly adaptable, yet consistent and reliable in each function. Its lineup of lighting fixtures, combined with hazers and fog machines, outfitted the Mook club with all the desired visual effects. For the installation of visual effects in this club, Martin provided 16 MAC 350 Entour high power LED’s, 16 MAC 101 moving head wash LED’s, two Jem K1 Hazers, two Jem ZR-44 Hi-Mass foggers and one LightJockey 2 Controller. The MAC 350 Entour does not fall short in high-powered brightness, coupling an 8000-lumen output with motorized iris. The fixture is Mook Club’s flagship lighting, co-existing with the club’s innovative design. The MAC 350 Entour’s dimming, strobing and shutter effects synchronize perfectly with a wide range of music, while its high rotational speed makes it an excellent partner to Mook’s fast-paced songs. Smoke is an indispensable element to high-end entertainment and lighting systems. Martin Jem K1 Superior performance, sustainable operation and consistent fog output ensures a uniform release of smoke density. The Jem K1 creates the fog by intelligently and efficiently mixing air with smoke oil to accentuate the rich and varied lighting effects. A low quantity of smoke oil is consumed, leaving no soot or pollution after use. To increase visual effects, Martin installed a Jem ZR44 Hi-Mass fogger to suit a host of performances in the club, which has a continuous fog output of 1200 m3/min. Martin systems are known to perform flawlessly throughout the night for club-goers. Through endless testing it ensures top-notch reliability and consistency of LED and smoke machine output. The LightJockey 2 console controls both smoke and lighting systems, which is one of the industry’s most popular PC control units in the past decade. The user-centric lighting control software is both user-centric and flexible. It is a crucial component for professional lighting performances.